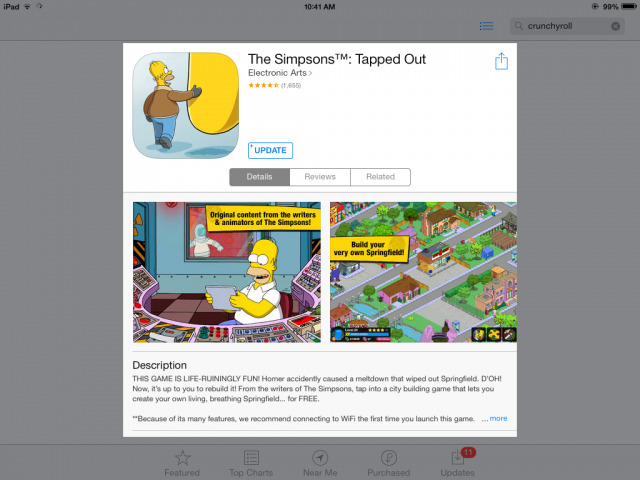 When it was first introduced it was very obvious that the mobile gaming community was not sure what to make of a new Freemium Grinder and City Building game that was based upon the Simpson IP. Perhaps one of the most significant forces of Pop Culture to impact entertainment across the spectrum, its morphing into a mobile game - and especially a Freemium mobile game - was an action with potential for calamity. 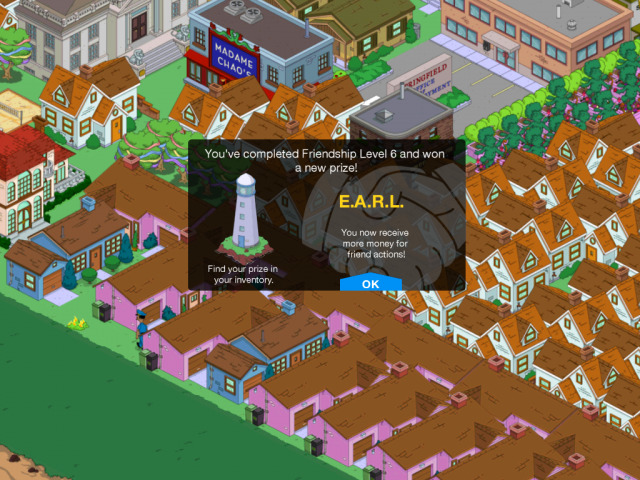 Instead of falling flat though, Tapped Out struck a cord with gamers - partly we suspect due to the immense and professional effort that went into both its creation and planning, and partly thanks to the serious approach that its developer, EA Games, has taken in keeping the game updated and fresh through a constant string of expansions, episode tie-ins, and holiday events. It does not hurt that they also took great pains in keeping the feel of the game as close to the feel of the TV show on which it is based. 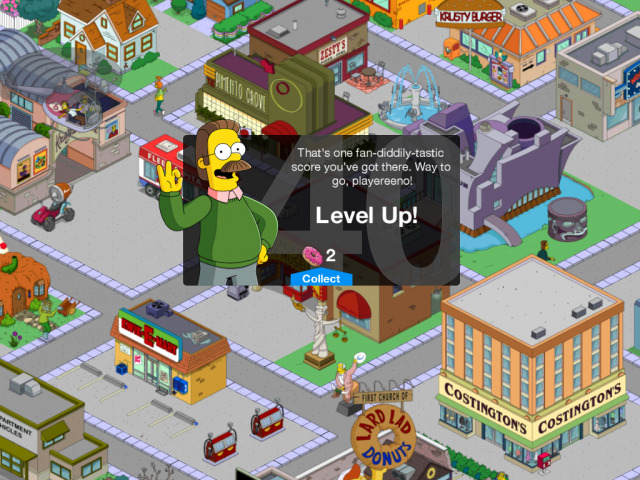 The Simpsons: Tapped Out begins with Homer Simpson playing a Freemium Grinder on his MyPad - and due to his total and complete engrossment in it, failing to react to the alarm on the board at his workstation. The result? The Springfield Nuke Plant melts down and explodes, taking out Springfield and the surrounding areas, including the infamous Krustyland Amusement Park (though we were not to discover the latter until well into the game). The premise then is simple: Homer needs to correct his bad judgement and help rebuild the town, along the way adding back into it its citizens, its landmarks, and its important businesses and government buildings. It is important to point out the nature of the Freemium Grinder as a game type, and the City Building genre to which this one belongs. First and foremost, the actual game itself is free. It is free to download, it is free to play. In fact if the player chooses to they can play through the entire story mode of the game without spending a single penny. But there is the rub... 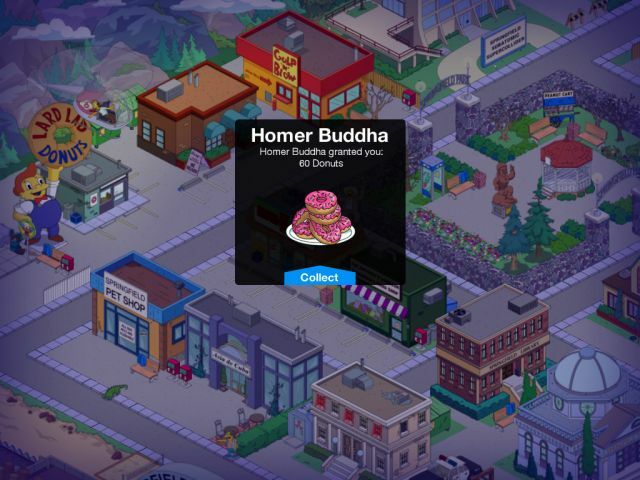 Even if the player obtains the game for free with that very intention, its wickedly clever design and the many special, or "Premium", items, objects, buildings, and characters are so desirable that they will find it harder and harder to resist spending some money to obtain sufficient Premium Currency (Donuts believe it or not) to get some of that special content. That is OK, really. Or more OK than it might seem, because when you take into account the immense and serious effort and the fact that this game was developed and maintained with the same level of quality and value as a for-pay title, giving into the urge to grab some of that Premium goodness is easy to understand. That being the case, gamers will find that while they will obtain loads of fun and entertainment for no cost at all, the decision to spend a little - or a lot - to get some of the extras really adds to the entertainment value of the game. As mentioned the game was developed and is being maintained and expanded with the same measure of attention to detail and concern for quality that is more commonly found in the retail-boxed version of games and the DLC expansion content that you usually have to pay for. 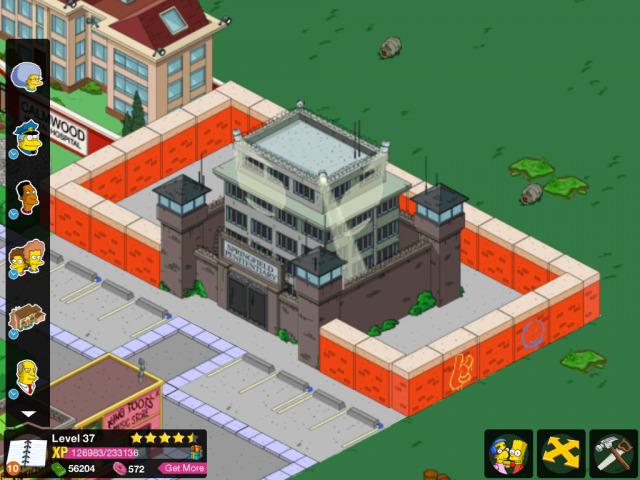 In the case of Tapped Out all of that is free - they make their money by selling you the special stuff, all the while packing in more and more new content, expansion content, and events to keep the game fresh and interesting. So in that sense, its longevity is assured. Now as for Game Play, well that comes in several flavors. The primary mechanism is City Building, which is to say buying the construction projects for the landmark buildings so familiar from the show, and then waiting out the timer for their construction. Some of these buildings add new characters to your town, and many are actually part of the Quest and Mission system in the game, so building them comes naturally. Speaking of the Quest and Mission system, it - and as a result the ability to build specific buildings and add specific characters - is dictated by the Level system, which is XP based. As you level up your town you get new quests and missions. As you get new quests and missions, the game pushes you to add specific buildings. As you add those buildings, you add new characters, thus increasing the population of your town and the game, and adding new story missions and quests. It is, in every sense, an ongoing and expanding process. Fortunately though the whole Mission and Quest based system of play is not the end all and be all of the game! 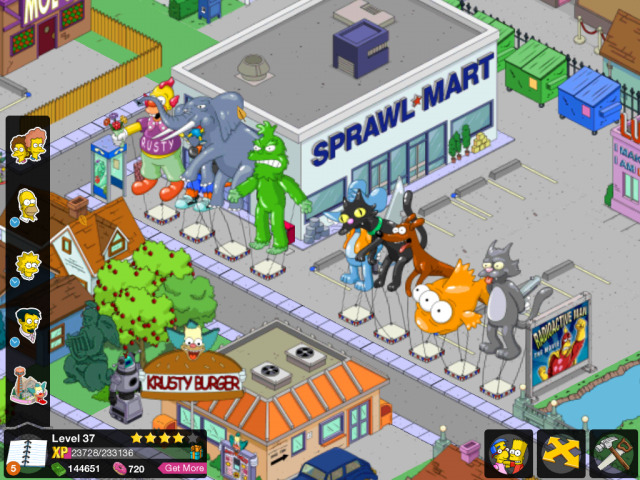 There is lots of leeway for adding additional structures as well as other objects that allows the player to fully customize their Springfield so that it is like - and unlike - the towns being rebuilt by their neighbors. Speaking of neighbors, Tapped Out includes a limited social networking aspect to it that permits the player to invite their real-world friends into their game by having them play the game themselves. Once added as a neighbor both you and your mate can visit each others town and help with construction. There are even special events in which that social aspect becomes a key element. Recently the game expanded its virtual points scheme to incorporate something called FP - or "Friend Points" - which are like XP but are collected for completing helper actions in the towns of your neighbors. Collect enough FP and you can unlock rare and unique objects, characters, and buildings to add to your town - just another element in the ongoing expansion and maturation of the game it appears. 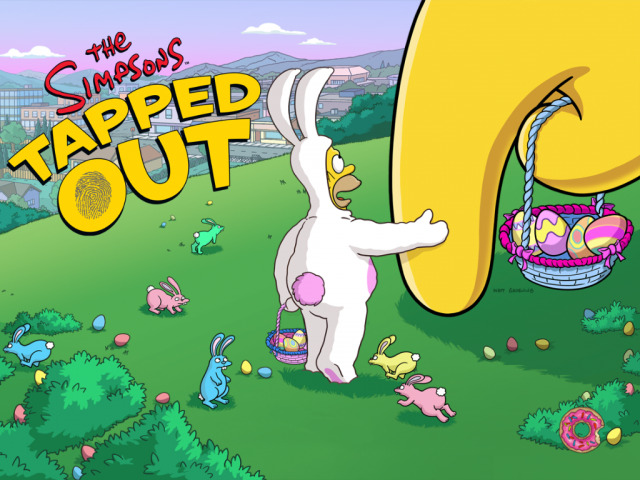 This game benefits mightily - that is to say and in game Simpson speak -- it is "Embiggened" by its relationship to the long-running TV show. Those benefits include the very broad musical archive from the show, which is put to good use in the game, as well as the obviously scripted voice work from the characters of the show. That's right, the vast majority of the characters in the game are voiced! When you tap on them they offer a series of scripted comments, and when you begin a quest - major and minor - they may also offer voiced comment, though the bulk of the Mission and Quest system is text-based to be sure. Still it is those small touches that extends the magic of the show into the game itself, and that is no small matter! The world in the game is the equal to the show in terms of animation and impact, and the quality is such that you should not be surprised to wonder just how it is that they can do this for free? Well, the answer is that they cannot - but then they don't have to because the special items and characters in the game are appealing enough to ensure that a reasonable portion of the player base regularly spends money in the game so as to ensure that the rest of the player base gets the benefits! It is very difficult to find fault with this game - in fact as you will see by the perfect rating that it earns that it is perhaps the symbol to be held up for its class and genre. That being said it would be a misdeed for us not to remind you that this is a game, and while spending money to get the good stuff is easily a tempting matter, it is a game mechanic that should be treated with care. Think twice before you spend loads on Donuts, then think three times before you spend them. You will find that taking the time to evaluate just what a Premium Item does for you in the game can help guide you in spending your Donuts properly, which in turn will only make the game better! In terms of value for money - considering that you start out not spending one dime - this is a good "buy" but even if you do decide to spend money on Donuts so you can get some of the good stuff, we still consider it, and its perfectly shaped entertainment, something of a bargain. The gamers who are serious about their game play call themselves "Tappers" -- and considering all of the Tapping you do in the game, well that makes sense. Give this one a Tapping try and you just might find that it ends up being your favorite mobile game. Mucho Taco is an idle clicker game where ..
NEW GAME! Angry Birds meets bubble shooter ..
Flip the pancake as many times as you can! One-button-action .. Aim, fire and pop your way through more ..